TNUSRB Police Constable Hall Ticket 2019 – Jail Warder, Fireman Admit Card, Exam Date: The higher authorities of Tamilnadu Uniformed Services Recruitment Board (TNUSRB) had not yet mentioned the exact examination date. And also not provided the TN Police Constable Hall Ticket 2019 release date clearly. It will be notified once the officials releases it. The TNUSRB Constable Hall Ticket can be downloaded only from the official site @ tnusrb.tn.gov.in. 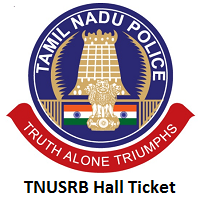 TNUSRB Police Constable Hall Ticket / Fireman Hall Ticket / Jail Warder Hall Ticket is very important for the candidates who are attending the TNUSRB examination 2019. Without TNUSRB Police Constable Hall Ticket 2019, Job aspirants will not be allowed inside the exam hall. If the details mentioned in the following sections are not correct or accurate bring it to our notice. We will intimate to the higher officials of the Tamilnadu Uniformed Services Recruitment Board (TNUSRB). They will correct the information and resend to us. We will update that data in this page. Candidates who are attending to the TNUSRB Police Constable Examination must go through this section. In this section, we had mentioned the details which will be present in the TNUSRB Police Contable Hall Ticket 2019 / TNUSRB Jail Warder Hall Ticket / TNUSRB Fireman Hall Ticket. Tamilnadu Uniformed Services Recruitment Board (TNUSRB) recruitment board had released the notification to fill the 15711 Constable, Jail Warder, Fireman Posts. Applied candidates can know the complete information about the selection process for the TNUSRB Police Jail Warder Recruitment. While appearing to the TN Police Jail Warder Examination, you are advised to carry some important documents to the exam center. These documents are needed for the verification purpose. So, all the candidates are advised to take any one of the below mentioned original documents along with the tnusrb.tn.gov.in Police Fireman Admit Card. Do not forget to take your TN Police Hall Ticket 2019 along with you while appearing to the exam it is a most important document to be carried. Are you ready to attend the TNUSRB Police Constable Examination? For that, you must initially download the TNUSRB Police Hall Ticket 2019. Following are the steps to download the admit card. So aspirants can make use of the following steps and can download the TNUSRB Police Constable Admit Card easily. Applied candidates initially have to go to the official website of the Tamilnadu Uniformed Services Recruitment Board (TNUSRB). The official site is tnusrb.tn.gov.in move to that website. You will get the TNUSRB main page. There click on the “click to enter site” button. Then you will get the home page of TNUSRB. In that home page search for the TN Police Hall Ticket 2019 link. After identifying the link open it. Fill the details present in it correctly. There hit on the submit button. You will get the tnusrb.tn.gov.in Police Fireman Admit Card on a new page. Download that TN Police Hall Ticket 2019 in the given format. After downloading the Hall Ticket cross check the details provided in it correctly or not and take two to three copies of the Admit Card. Carry those copies of TNUSRB Constable Hall Ticket along with you while appearing to the examination. Moreover, we advise you to keep in touch with our web portal Freshers Now for more updates about the TNUSRB Police Constable Admit Card 2019. If any queries contact us by using the comment section.